. . . so said “Dennis the peasant” in Monty Python’s Holy Grail movie. Poor Arthur. He was only trying to be civil. 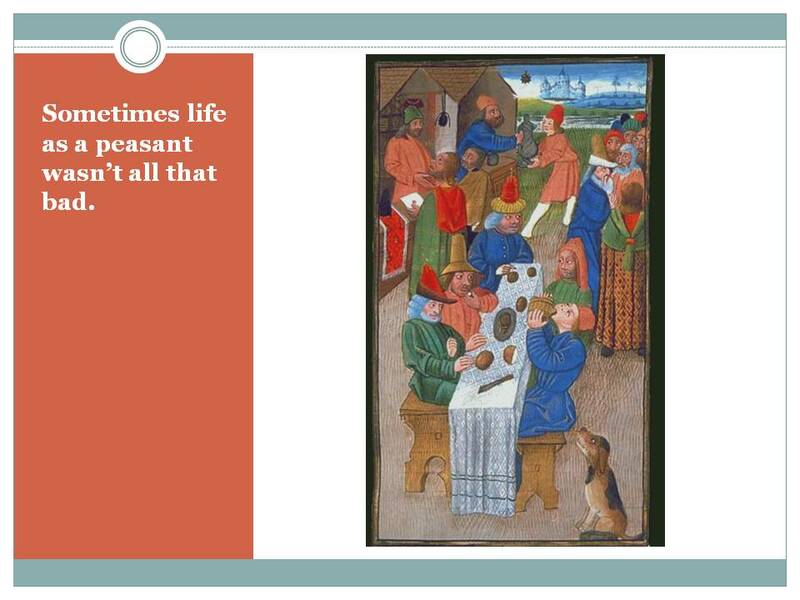 But the peasant was so annoying! [many thanks to the “anonymous fan” who transcribed the script from which the following is excerpted] . 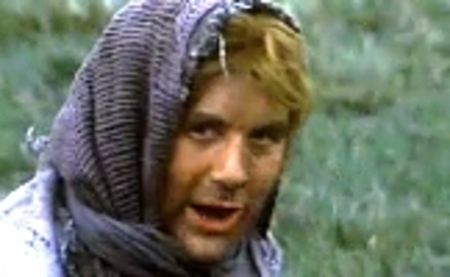 . .
ARTHUR: We’re all Britons and I am your king. WOMAN: I didn’t know we had a king. I thought we were an autonomous collective. WOMAN: Oh there you go, bringing class into it again. ARTHUR: Please, please good people. I am in haste. WOMAN: We don’t have a lord. DENNIS: I told you. We’re an anarcho-syndicalist commune. We take it in turns to act as a sort of executive officer for the week. DENNIS: But all the decision of that officer have to be ratified at a special biweekly meeting. WOMAN: Order, eh — who does he think he is? Throughout most of the Middle Ages, ideas about social hierarchy were incredibly powerful. This can be a hard concept for those of us living in 21st-century America to wrap our minds around, the idea that once you were born into a particular social class—that was your destiny. Upward mobility was practically unheard of in the early medieval period (that is, about 500 AD through 1000 AD) and the high medieval period (1000 AD through 1300 AD), although in the late medieval period (1300 through 1500 AD), social structures become more fluid. At the top of this social order known as the three estates were the nobles, those who fought. This class included those who held hereditary titles—from kings, to dukes and earls, and down to knights—your basic armored swordsmen, who occupied the lowest rung of the noble ladder. 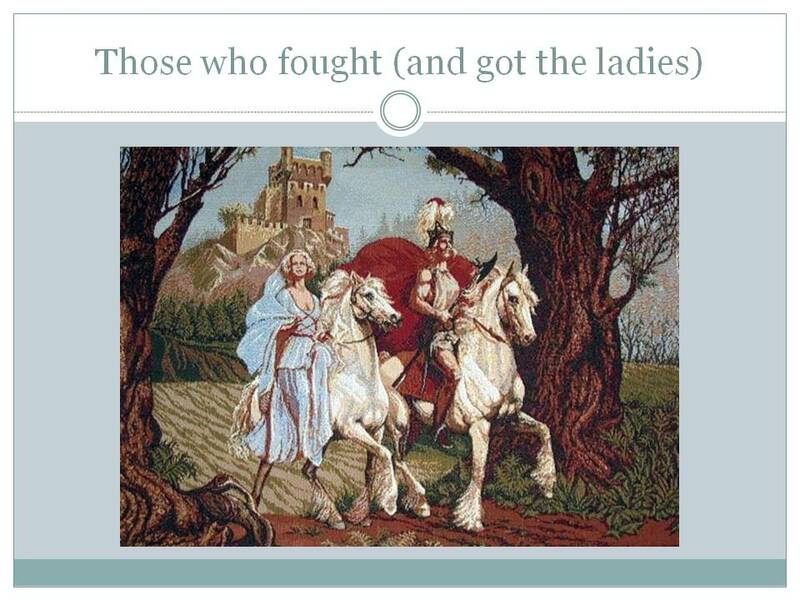 In the Early Middle Ages (again, 500 – 1000 AD), the equation was simple: Those who were powerful and won battles ruled. In the High Middle Ages (1000 – 1300), we start to see more and more that those who conquered wanted to pass their power and status on to their offspring. So a hereditary nobility develops—in which people came to power more because of their bloodlines and less because of any battles won. To be a successful lord, one needed essentially two things—castles, and vassals. Having a castle was important if you were a lord, because it meant that you could protect yourself (and your vassals!) when would-be conquerors set their sights on a particular piece of territory. In addition to castles, a lord needed vassals to support his cause and interests. Simply put, a vassal was a man who had sworn homage and faithfulness to a lord. The lord gave the vassal first, protection; second, support; and third, a grant of land called a “fief.” The vassal reciprocated by first, swearing to fight on the lord’s behalf and second, rendering him a certain number of days of service a year. The system of vassalage in the medieval world worked much like a pyramid—the king was at the top, and the upper echelons of the nobility would swear fealty to him as his vassals. In turn, these lords would have homage done to them by nobles further down the food chain, who would become their vassals—and as a lord you would look for vassals who both could fight well and were unimpeachably loyal. But now we turn to the second estate: below the nobles were the clergy and monastics, “those who prayed.” And in fact, this estate overlapped with the noble estate, as clergy and monastics very often came from the noble classes. Why would a noble decide to join the clergy or a monastic order? Surely the perks were not as good as those of nobility! Well, sure if you had your preference, you’d stay a noble! And you could do that as a young man or woman, as long as you were . . . a FIRST CHILD. How many first children here? Hands up. OK, let’s say your dad’s a noble. Here’s what would have happened through most of the Middle Ages after the 9th or 10th century. In order to keep his estate intact, your dad would pass that estate on only to ONE of the children—you guessed it, the first child . . . YOU. That system is called primogeniture, and it meant that the rest of you . . . Who here is NOT a first child? Hands? Well you guys, if you didn’t want to find some other Lord to become a vassal to, you would often decide that the next-best option would be to enter religious life. Now that may sound like a bummer. Either you spend all your time in the parish as a priest, dealing with everyone else’s problems, probably living in a modest house associated with the village church—much more modest than your dad’s place. 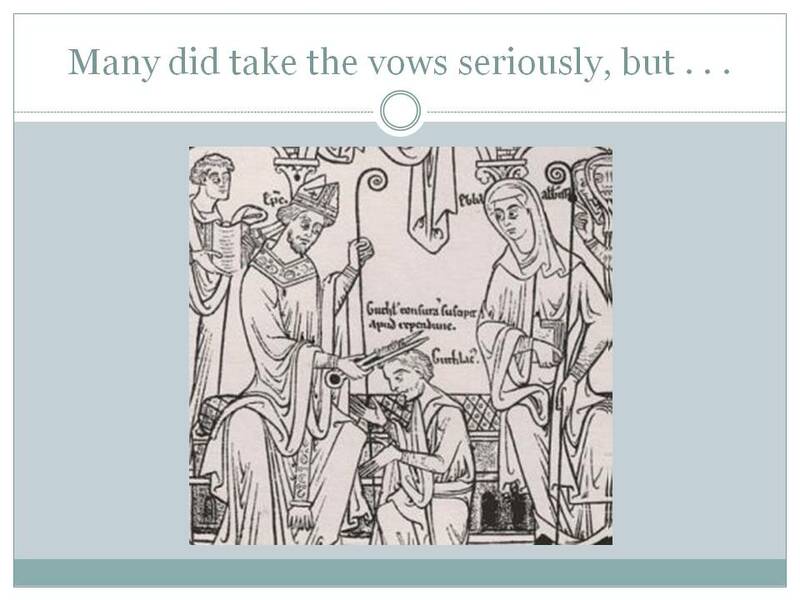 Or, you’d enter the monastery with all those lovely vows. You know the ones: poverty (ouch). Obedience to your abbot in absolutely everything (double ouch). And of course, celibacy. (pause.) Yeah, triple ouch. Given the choice, many children of nobility chose the religious life. And it probably won’t surprise you when I tell you that, although there were many sincerely and devoutly religious members of the clergy and monastic houses, there were a whole bunch of these nobles’ kids who entered the priesthood or the monastic life, but continued to maintain the sort of lifestyle to which they had become accustomed in their secular lives, as members of the noble classes. In fact, although required to take all these vows of poverty, chastity, and so forth, many previously noble clergymen and members of monastic orders owned goods and property and had wives (or at least mistresses or concubines) and children—a situation that was widespread enough that church councils from the 12th to the 13th centuries spent a lot of time forbidding it in the strongest language possible. So much for the monastic ideals of celibacy and poverty. While the orders of the nobility and clergy were almost side-by-side at the top of the social order, at the bottom were the peasants—those who worked. Although medieval society was ideally separated into these three estates, the divisions were by no means equal. Some historians estimate that the nobility and clergy made up between 5 to 10% of the population, while the peasants—everyone else—might have comprised as much as 95% of the people living in the medieval world. In light of this, I want to give a bit more time to this estate of the peasants or, as they were called from around the 10th century on, the serfs. 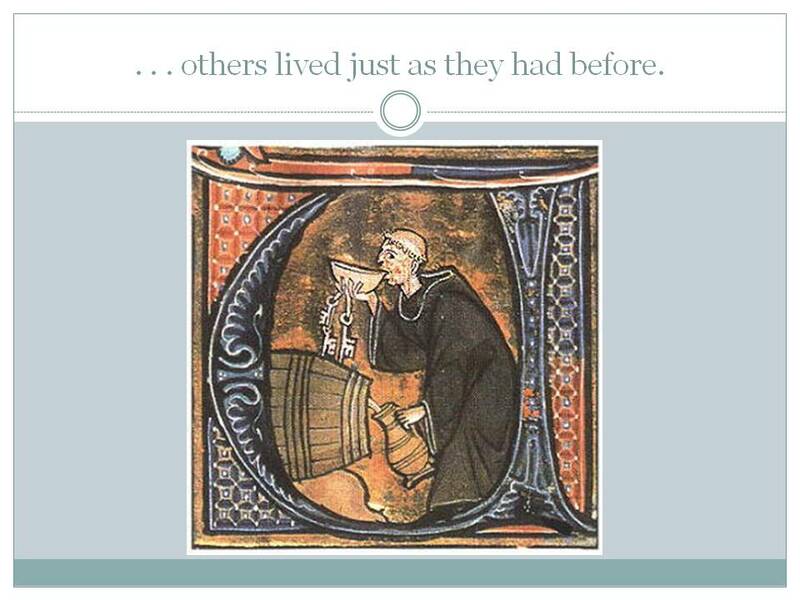 If you were a peasant, you were most likely born in a village that was also attached to the manor of a lord. Let’s look at both of these terms. 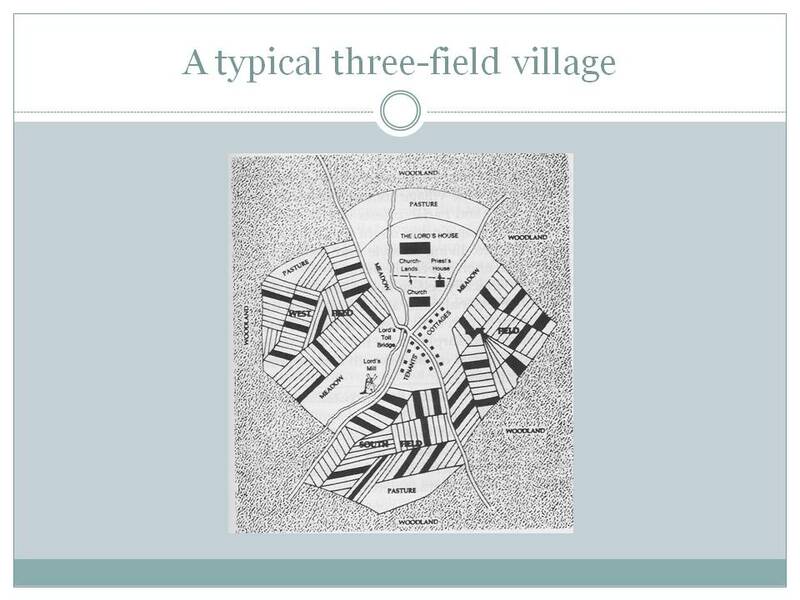 First, what was a village? Well, from pretty much the barbarian invasions of the 5th century through the end of the Middle Ages, Western Europe was largely a farming society. 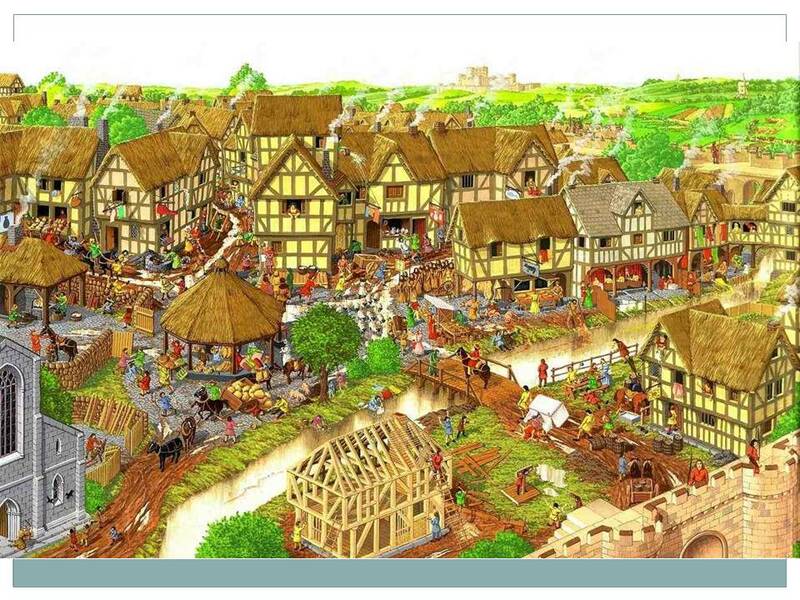 And from around the 9th or 10th century on, the basic unit of the farming economy was the village, which consisted of a group of peasant families, from about a dozen to several hundred, living in a cluster, encircled by their fields. The houses tended to be set close together, often centered on a village green, or a well or fish pond. At the center of the village was often to be found a parish church, and the social and religious life of villagers typically centered on their churches. By the late 900s, the village population also typically included a substantial group of artisans—wheelwrights, blacksmiths, carpenters, coopers, and joiners. With their help, peasant families were able to build larger and better-constructed cottages than in the centuries before. Second, what was a manor? Well, it was an artificial social unit—a unit of jurisdiction controlled by a single lord. The lord might be a king or a great nobleman or churchman with numerous manors under his control. Or he might be a simple knight with only one or two manors at his disposal. The manor was often geographically identical with the village, but some manors embraced two or more villages, and an occasional large village might be divided into two or more manors. While the farming routine of plowing, planting, and harvesting was based on the village organization, the peasants’ dues, obligations, and legal and political subordination were based on the manor. The lord also enjoyed significant jurisdictional authority over his peasants. The administrative center of the manor was the manorial court, usually held in the lord’s castle or manor house. Here a rough, custom-based justice was meted out, disputes settled, misdeeds punished, and obligations enforced. Since most lords possessed more than one manor, authority over individual manors was commonly exercised by an agent known as a “bailiff,” or “steward,” who supervised the manorial court, oversaw the farming of the demesne, and collected the peasants’ dues. Many things we consider basic individual rights today—for example, getting married—would be subject to your lord’s approval. If he did agree to your marriage, you would usually have to pay a marriage tax—often in grain or livestock. And when your father died, your family would have to pay a similar tax. The logic of this was that the lord would no longer have the benefit of the labor of your dad, so he needed some sort of compensation. 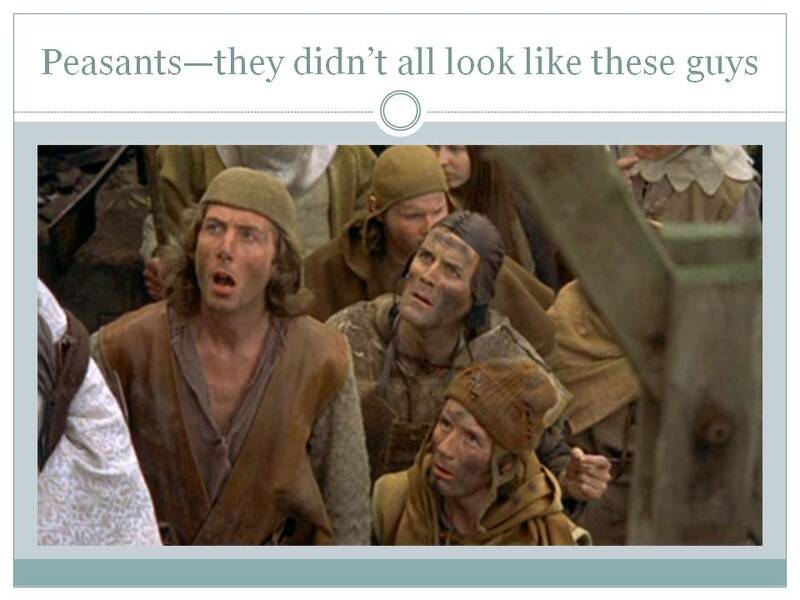 In theory, serfs had no standing before the law. But most lords were restrained from exploiting them arbitrarily by the force of custom. Some lords ignored this restraint and abused their serfs pitilessly. But custom was strong in the Middle Ages and could protect serfs in many ways. Now, technically, serfs were unfree—bound to the manor on which they lived and worked, and bound also to the lord of the manor. But they were by no means chattel slaves: they could not normally be sold away from their lands or families, and after paying their manorial dues, they were entitled to the remaining produce of their fields. The serf’s condition was hardly enviable, but it was better than the slavery of ancient times. And we can see why serfs would be OK with these limitations on their freedom. There was in fact a small proportion of the population who were known as freeholders—peasants who owned and worked their own lands, or who paid a nominal rent to a lord, but did not otherwise owe him service. If you were to ask almost anyone living in 21st-century America today if they would prefer to be free or unfree, the answer would be clear: free, of course. Yet if you were to ask a peasant living in the medieval world that same question, the response might be: “Well, how much land do I get?” Given the choice of being a free man with little or no land, or a serf with lots of land under one’s control, the medieval peasant is going to pick unfree with land almost every time. Even without the promise of substantial land, serfdom provided many benefits to those of the peasant class in the form of guaranteed protection, food, and clothing in times of difficulty—it was a safety net. Especially in times of war and invasion, many previously free peasants decided to give up their freedom in exchange for the protection of nearby lords. This entry was posted in Medieval Wisdom for Modern Protestants and tagged class, feudal system, feudalism, Middle Ages, Nobility, Serfdom, sociology. Bookmark the permalink. Rick – the only way I know of getting any of these would be to get in touch with the folks at http://www.christianhistorymagazine.org, but it is likely that all are out of print and unavailable. eBay perhaps?